As part of the Miss Selfridge Denim Breakfast I attended at the beginning of April, I was able to choose two pieces to style with a pair of their new jeans collection. I opted for this denim shirt dress which works with or without jeans and is fulfilling my needs for 70s shirts and D ring belts. Alongside the dress, I bough this flowy jacket, perfect for a casual day out or a formal evening look. It is the ideal weight for Spring and Summer, giving you the extra warmth you might need without having to wear a coat. And finally.. I've got myself a pair of mules, and yes they are as comfy as everyone says they are! 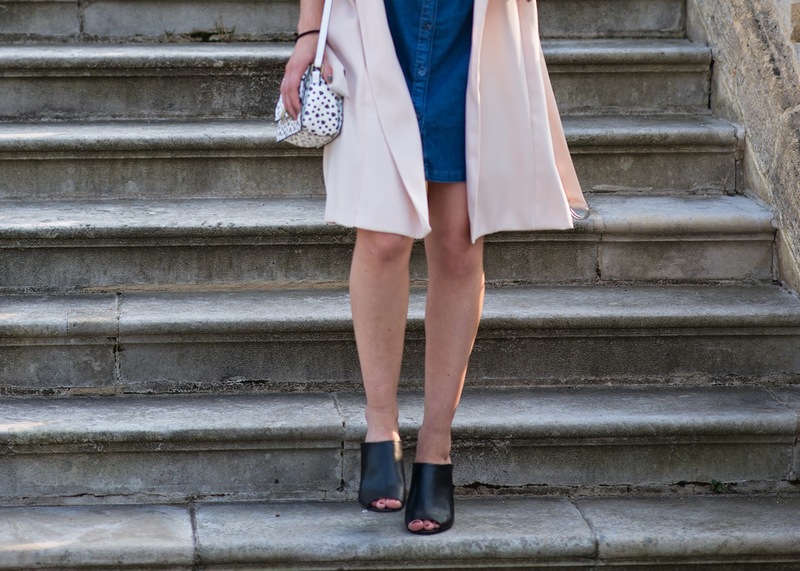 I spotted a dusty pink pair in Topshop recently that went straight onto my wishlist. Again, the bag works perfectly styled with this outfit as it picks out the black in the shoes and remains ideal for Spring with its floral print. Have you got your hands on any mules?